At Texas Eye and Laser Center, we have always prided ourselves on offering our patients state-of-the-art technology, which is why we are excited to introduce the incredible iFS™ Advanced Femtosecond Laser. Previous lasers used have been highly efficient and safe, but like trading in a reliable vehicle for a high performance sports car, the upgrade to the 5th generation of iFS™ Advanced laser allows for a faster, smoother, more controlled LASIK procedure than ever before. Your custom LASIK experience at Texas Eye and Laser Center will truly be an eye opening experience, leaving you with amazing, clear vision and a new found freedom. The iFS™ Laser gives surgeons and patients a combination of advantages including stronger flaps, fewer possible complications and faster visual recovery. Ophthalmologists using the first experimental femtosecond lasers worked with technology that operated at 2 kHz and took 5 minutes to create the necessary corneal flap. Today, with the 5th generation iFS™ Advanced Femtosecond Laser, our surgeons are operating at 150 kHz and can create the flap in just 8 seconds! This is approximately 2 ½ times faster than the previous model. The important thing to remember is that speed does not mean less control. In fact speed is an asset and allows for greater control and less chance the patient experiences any discomfort. With the inverted side-cut technology, the corneal flap virtually “locks” into place, creating even more corneal stability. Additionally, the higher rate of speed allows for less energy to be used on each laser pulse, which can leads to a overall better outcome and experience. The main benefits can be seen with faster healing times, improved corneal stability, smooth corneal surface, and clear vision sooner rather than later. Speed equals less discomfort and a smoother overall procedure. Corneas are naturally oval shaped. So naturally the flap that is created should be oval shaped as well, right? Up until now, previous lasers have cut a generic circle flap. But that is where the iFS™ Advanced Femtosecond Laser sets itself apart from the rest, by bringing an innovative new oval flap creation technique. The results are preserved corneal nerves, better biomechanical stability, and the ability to locate the flap size and location to the exact area of the cornea needing treatment. The oval flap also gives our surgeons an advantage when dealing with farsightedness and astigmatism, an advantage that was previously unavailable. Also new to the surgery suite is the implementation of the “heads-up” touch screen which allows our surgeons and assistants an even greater amount of precision than before. Together with improved corneal strength, a faster procedure, and fewer to no complications, the iFS™ Advanced Femtosecond Laser speaks for itself with the number of successful LASIK procedures it has performed and the lives it has improved. You can unlock a whole new world of visual freedom. 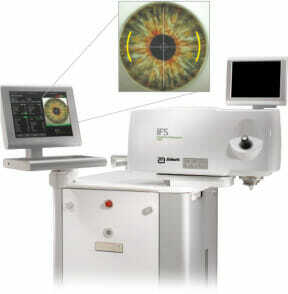 The key is iFS™ Advanced Femtosecond Laser! At Texas Eye and Laser Center we combine advanced technology with “personal touch” patient care for faster visual recovery in a friendly environment.